6300 NS SD50S 6502 11-2008 NS 12-1980 806030 806030-3 NS LEADER/PTC Equipped. 6301 NS SD50S 6504 01-2009 NS 12-1980 806030 806030-5 NS LEADER/PTC Equipped. 6303 NS SD50 6523 11-2008 NS 07-1984 837073 837073-3 NS LEADER/PTC Equipped. 6305 NS SD50 6513 01-2009 NS 07-1984 827041 827041-8 NS LEADER/PTC Equipped. 6306 NS SD50 6508 02-2009 NS 07-1984 827041 827041-3 NS LEADER/PTC Equipped. 6307 NS SD50 6506 04-2009 NS 07-1984 827041 827041-1 NS LEADER/PTC Equipped. 6308 NS SD50 6519 03-2009 NS 07-1984 827041 827041-14 NS LEADER/PTC Equipped. 6310 NS SD50 6514 05-2009 NS 07-1984 827041 827041-9 NS LEADER/PTC Equipped. 6312 NS SD50 5417/CR 6729 02-2009 NS 12-1983 837047 837047-30 NS LEADER/PTC Equipped. 6313 NS SD50 5428/CR 6750 03-2009 NS 05-1984 837065 837065-7 NS LEADER/PTC Equipped. 6314 NS SD50 5431/CR 6754 06-2009 NS 05-1984 837065 837065-18 NS LEADER/PTC Equipped. 6316 NS SD50 5433/CR 6761 09-2009 NS 06-1984 837065 837065-31 NS LEADER/PTC Equipped. 6317 NS SD50 5437/CR 6769 08-2009 NS 06-1984 837065 837065-37 NS LEADER/PTC Equipped. 6319 NS SD50 5427/CR 6749 10-2009 NS 05-1984 837065 837065-16 NS LEADER/PTC Equipped. 6320 NS SD50 5402/CR 6706 11-2009 NS 11-1983 837047 837047-7 NS LEADER/PTC Equipped. 6321 NS SD50 5404/CR 6708 12-2009 NS 11-1983 837047 837047-9 NS LEADER/PTC Equipped. 6322 NS SD50 5436/CR 6766 03-2010 NS 06-1984 837065 837065-39 NS LEADER/PTC Equipped. 6323 NS SD50 5408/CR 6714 04-2010 NS 11-1983 837047 837047-15 NS LEADER/PTC Equipped. 6324 NS SD50 5400/CR 6700 05-2010 NS 11-1983 837047 837047-1 NS LEADER/PTC Equipped. 6325 NS SD50 5409/CR 6715 06-2010 NS 12-1983 837047 837047-16 NS LEADER/PTC Equipped. 6326 NS SD50 5444/CR 6777 06-2010 NS 05-1984 837065 837065-14 NS LEADER/PTC Equipped. 6329 NS SD50 5434/CR 6762 10-2010 NS 06-1984 837065 837065-32 NS LEADER/PTC Equipped. 6330 NS SD50 5426/CR 6748 11-2010 NS 05-1984 837065 837065-11 NS LEADER/PTC Equipped. 6331 NS SD50 5410/CR 6716 12-2010 NS 11-1983 837047 837047-17 NS LEADER/PTC Equipped. 6332 NS SD50 5414/CR 6723 01-2011 NS 12-1983 837047 837047-24 Unit currently stored, but still on the active roster. 6333 NS SD50 5407/CR 6713 02-2011 NS 11-1983 837047 837047-14 NS LEADER/PTC Equipped. 6335 NS SD50 5423/CR 6742 04-2011 NS 05-1984 837065 837065-3 NS LEADER/PTC Equipped. Unit currently stored, but still on the active roster. 6336 NS SD50 5442/CR 6775 05-2011 NS 05-1984 837065 837065-20 NS LEADER/PTC Equipped. 6337 NS SD50 5418/CR 6730 06-2011 NS 12-1983 837047 837047-31 NS LEADER/PTC Equipped. 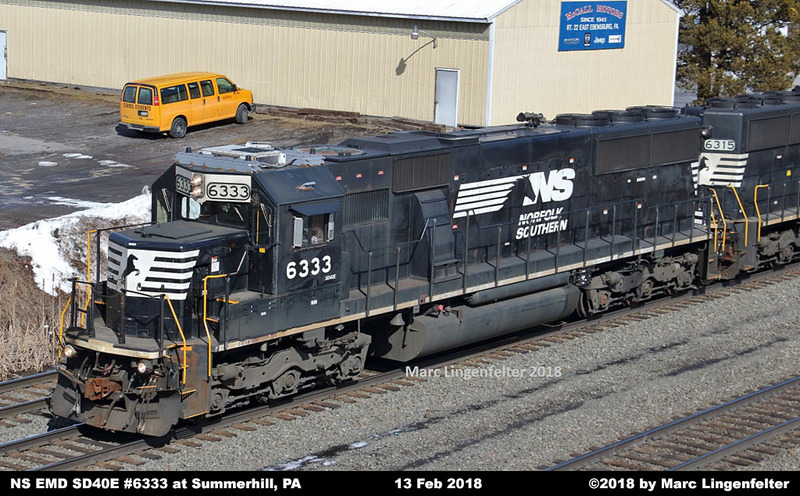 6338 NS SD50 5435/CR 6765 06-2011 NS 06-1984 837065 837065-36 Unit currently stored, but still on the active roster. 6340 NS SD50 5413/CR 6722 08-2011 NS 12-1983 837047 837047-23 NS LEADER/PTC Equipped. 6342 NS SD50 5430/CR 6753 09-2011 NS 05-1984 837065 837065-17 NS LEADER/PTC Equipped. 6343 NS SD50 5405/CR 6710 10-2011 NS 11-1983 837047 837047-11 NS LEADER/PTC Equipped. 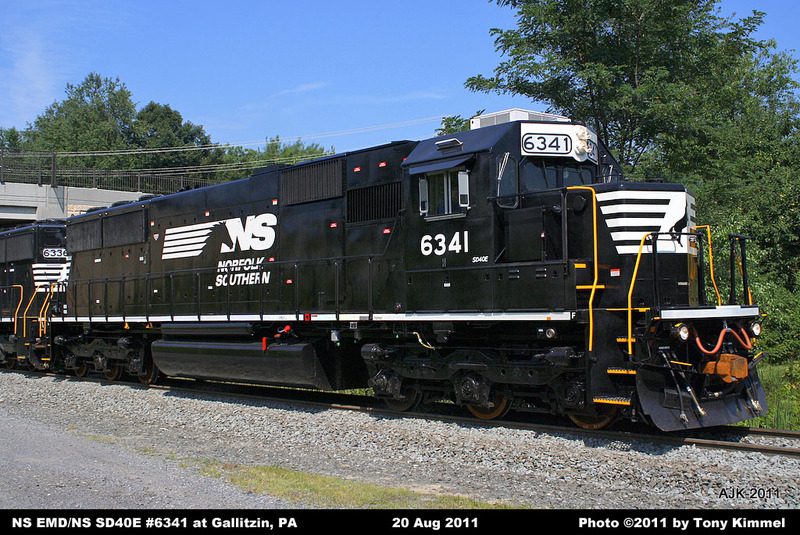 6345 NS SD50 5445/CR 6778 11-2011 NS 05-1984 837065 837065-13 Unit currently stored, but still on the active roster. 6347 NS SD50 5429/CR 6752 01-2012 NS 05-1984 837065 837065-15 NS LEADER/PTC Equipped. 6348 NS SD50 5415/CR 6724 11-2012 NS 12-1983 837047 837047-25 NS LEADER/PTC Equipped. 6349 NS SD50 5401/CR 6702 01-2013 NS 11-1983 837047 837047-3 NS LEADER/PTC Equipped. 6352 NS SD50 5443/CR 6776 06-2013 NS 05-1984 837065 837065-19 NS LEADER/PTC Equipped. 6357 NS SD50 5424/CR 6743 01-2014 NS 05-1984 837065 837065-4 NS LEADER/PTC Equipped. Unit currently stored, but still on the active roster. Powered by an EMD 16-cylinder 645E3C engine. Units 6300-6349 are equipped with 26-L air brake system. Units 6351-6357 are equipped with CCB 26 electronic air brake system. Units 6300-6311 are equipped with EMD Flexicoil HT-C trucks. Units 6312-6357 are equipped with EMD Flexicoil-C trucks. Units 6300-6333 equipped for Helperlink operations in helper service. Units 6350-6357 are equipped with Pacesetter speed control for mine loading service. 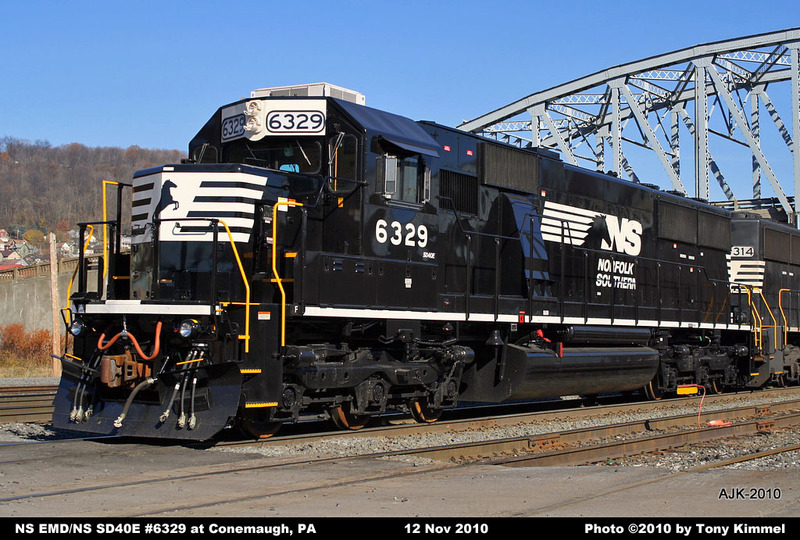 * Note: Units were originally designated as model SD40-E by NS, but changed to SD40E.